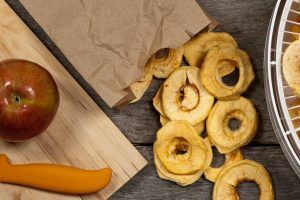 Food dehydrators might not be as prolific as some of the other kitchen appliances, but they are quite useful. Also, making your own dried food is actually a lot of fun since it opens up a completely new dimension into the homemade-food paradigm. After all, you’re essentially making your own beef jerky. What you can do with the dehydrator is really limited to the extent of your imagination. The best part of all, you have delicious and healthy snacks for everyone in the family. It’s the perfect alternative to unhealthy snacks we all tend to eat all the time. 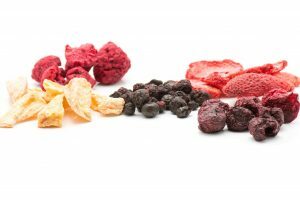 In this article, we will go through a particular brand of dehydrator—possibly even help you with your purchase. 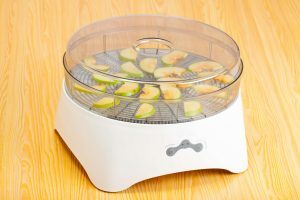 After all, if you’re reading this article, you’re either looking for a new dehydrator or will, at least, be thinking about getting one after reading through it. A food dehydrator is a simple kitchen appliance that is used to dry and dehydrate food. 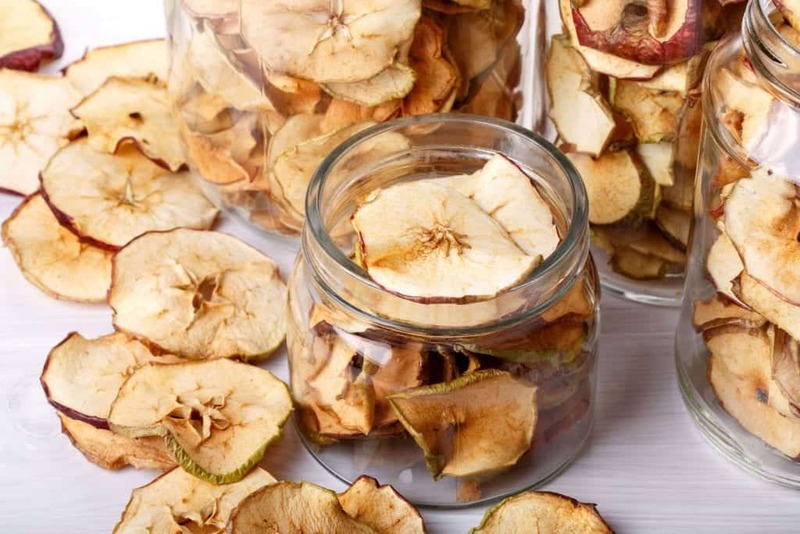 Of course, it’s a good way to preserve food, but it’s an even better way to have delicious snacks. 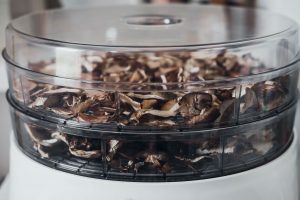 These beef jerky makers or food dehydrators have built-in fans that create a soft flow of hot air that slowly dries the food and turns them into crunchy snacks. Another great thing about dehydrating food is that it doesn’t lose any real amount of its nutritional value. Cooking, on the other hand, lowers the nutritional content of food. Nevertheless, we are not suggesting anything by that; it’s just another motivating factor. 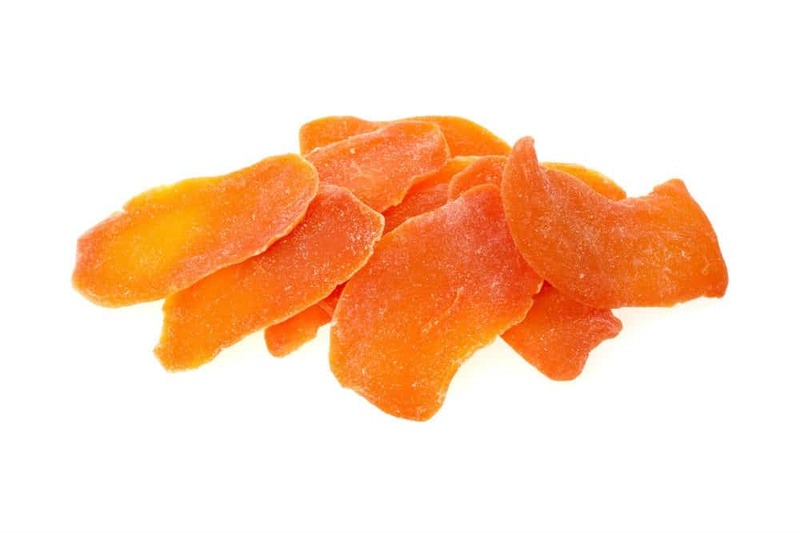 can offer in terms of homemade dehydrated food. Let’s start with its features. First are the more important aspects of any kitchen appliance—safety and durability. This appliance has a specific type of BPA-free plastic body, which is also non-flammable. Its plastic body is quite sturdy with glass-hinged doors that provide a clear view of the food being dried. The dehydrator offers eleven trays, which is ideal for making large batches of dried food. Its central fan ensures an even flow of hot air, which hastens the process and also ensures proper heat on all sides of the food. Using the dehydrator is pretty easy. 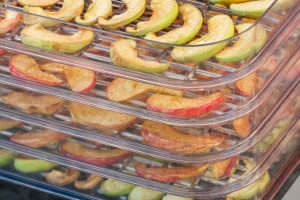 Unlike most dehydrators, it is completely digital, which means you can precisely set the temperature you need for best results. Additionally, you can also use the auto-shutoff timer and forget about the dehydrator without worrying about over drying the food. The appliance has a maximum heating temperature of 167ºF. According to the Tribest website, Sedona Express is the first ever home-based food dehydrator with such maximum temperature, which is particularly important because it conforms to the USDA’s guidelines when it comes to beef jerky preparation. Also, the higher temperature is actually quite convenient. That is because in most dehydrators, you would have to first pre-cook the meat. Hence, when using Sedona Express, you can put raw meat directly into the dehydrator without any worries. Its two-stage sequential temperature timer allows you to pre-set changes in the temperature during the dehydration process. Its continuous operation mode allows you to continuously use the dehydrator for up to 99 hours at a time. The overheat protection feature eliminates the risk of overheating the food, which can needlessly diminish the nutritional value of the food. It comes with a decade of warranty, which is the longest for any commercially available dehydrator. 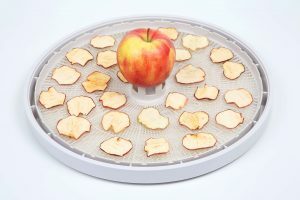 The dehydrator does not have a data storage capacity, which means if it loses power, even for a split second, it would require you to start the machine all over again. The timer only displays the time in hours, which feels quite antiquated and doesn’t really make much sense. The instruction manual is not as helpful as it should be, especially considering that it is more than just a press-and-play appliance. 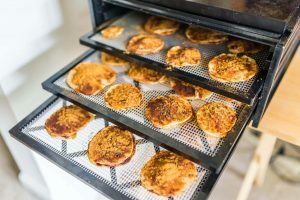 As you can see from its features, pros and even its cons, Tribest Sedona Express is anything but your standard food dehydrator. In spite of its downsides, it is one of the high-end models you can get for your kitchen. 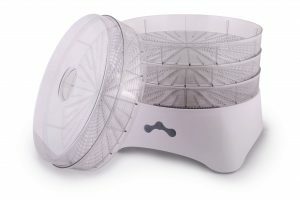 Since it has so many features, it offers a degree of convenience that most other dehydrators don’t. The one that particularly stands out is its TST timer. Such gives you the liberty of just starting the dehydrator and forgetting about it until it is done. It literally doesn’t require any further input from your side. is another high-end dehydrator that can serve as a decent benchmark for comparing Sedona Express. Unlike Sedona Express, it is completely made out of stainless steel. It supports up to ten stainless steel dishwasher-friendly trays. It has a rear fan that ensures uniform drying. The dehydrator has a maximum heating temperature of 155ºF, which is considerably lower than Sedona Express. And its timer supports up to 40 hours of continuous use. Lastly, the dehydrator comes with a cookbook for dehydrating food, which is quite handy unless you’ve been experimenting with food dehydration for a while. 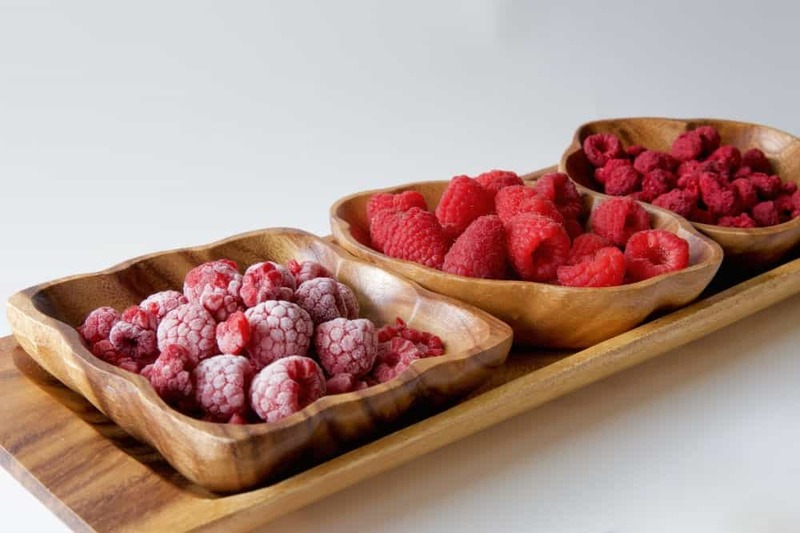 As mentioned earlier, Tribest Sedona Express is the first home-based dehydrator to offer a maximum heating temperature of 167ºF, which has convinced us that this product is a worthy purchase. However, even if you overlook this vital aspect of the appliance, you will still find enough reasons, like its automatic shut-off feature, to opt for Sedona Express. 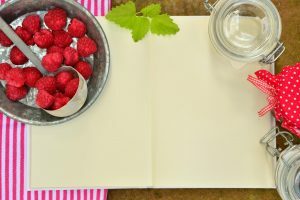 Yes, a dedicated cookbook for dried food is an absolute must, but we must still base our decision on the practical features and conveniences the appliance offers.